Motohashi, R., Enoki, H., Fukazawa, C. and Kiriiwa, Y. (2015). Hydroponic Culture of ‘Micro-Tom’ Tomato. Bio-protocol 5(19): e1613. DOI: 10.21769/BioProtoc.1613. Suzuki, M., Takahashi, S., Kondo, T., Dohra, H., Ito, Y., Kiriiwa, Y., Hayashi, M., Kamiya, S., Kato, M., Fujiwara, M., Fukao, Y., Kobayashi, M., Nagata, N. and Motohashi, R. (2015). Plastid proteomic analysis in tomato fruit development. PLoS One 10(9): e0137266. 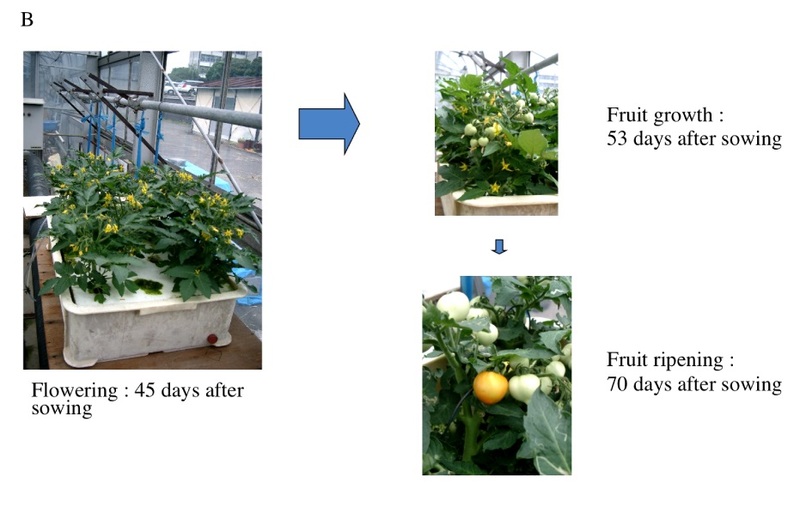 We use ‘Micro-Tom’ to study tomato fruit ripening and development mechanisms. ‘Micro-Tom’ is suitable for cultivation and experiments due to its small size of 10 to 20 cm in height and short life cycle of 3 months. There is also an abundance of publically available information on ‘Micro-Tom’ including EST, full-length cDNA clones and transcriptome data. ‘Micro-Tom’ plants are grown in hydroponic culture under fluorescents using Arabidopsis cultural shelves in greenhouses or plant rooms to get data with reproducibility for transcriptome and proteome analyses. Figure 2. Parts of hydroponic culture system. A. Blower, B. 6 mm silicon tube, C. Three-way tube, D. Air stone (17 x 17 x 60 mm). Figure 4. Growing ‘Micro-Tom’ plants using hydroponic culture. A. From seed germination to moving seedlings into hydroponic culture; B. From flowering to ripening. Soak seeds in distilled water overnight in a shallow container to germinate (Figure 4A). 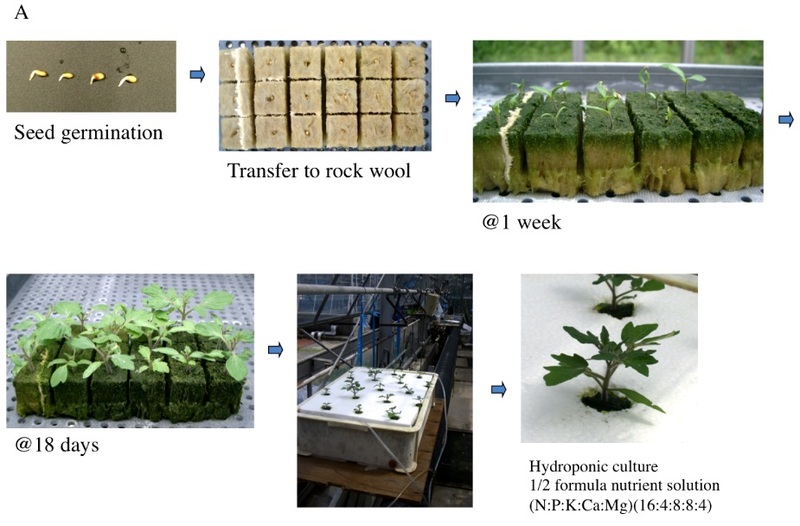 Transfer germinated seeds to rock wool (Figure 4A). Grow ‘Micro-Tom’ seedlings for approximately 2 weeks (Figure 4A). 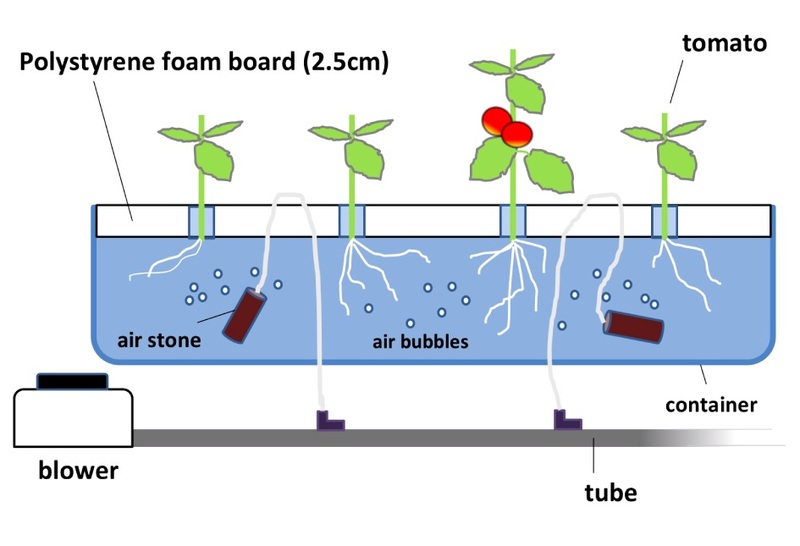 Transfer ‘Micro-Tom’ seedlings by removing them with rock wool still attached and placing them into the holes in the polystyrene foam board (Figure 4A). Add 1/2 formula nutrient solution (diluted to half concentration with water) into the container (filling it to about 2/3), and use the blower to send air bubbles into the root zone of the tomato plants (Figure 5). Flowers bloom at approximately 45 days after sowing, and fruits begin to grow larger at approximately 53 days after sowing. Ripening begins at approximately 70 days after sowing (Figure 4B). Note: By using the three-way tube, you can send air bubbles from 1 blower into multiple containers for increased efficiency. It is worth mentioning that improper air bubble supply to root zones will usually result in poor plant growth and ultimately rot symptoms. Hydroponic culture does not rot as it is constantly receiving air supply, but needs to be changed about once every 7 days (with a new nutrient solution). Polystyrene foam board that is smaller than the container may leave hydroponic culture exposed to light, which can lead to algae growth. 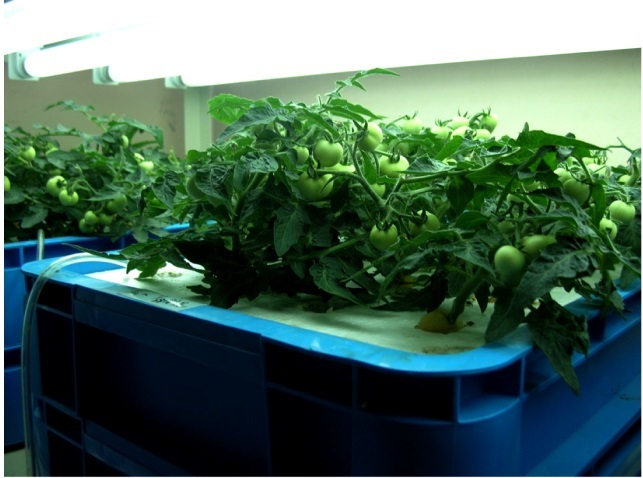 As plant growth continues hydroponic culture will slowly be consumed, which can leave a thin air space between the polystyrene foam board and the culture, leading to problems with growth. The foam board needs to be the same size and fit well into the container, preferably with sponge/rock wool being soaked in culture. In addition to growth in greenhouse conditions, we also developed a protocol for hydroponic growth in a plant room (6 h light/8 h dark at 26 °C). 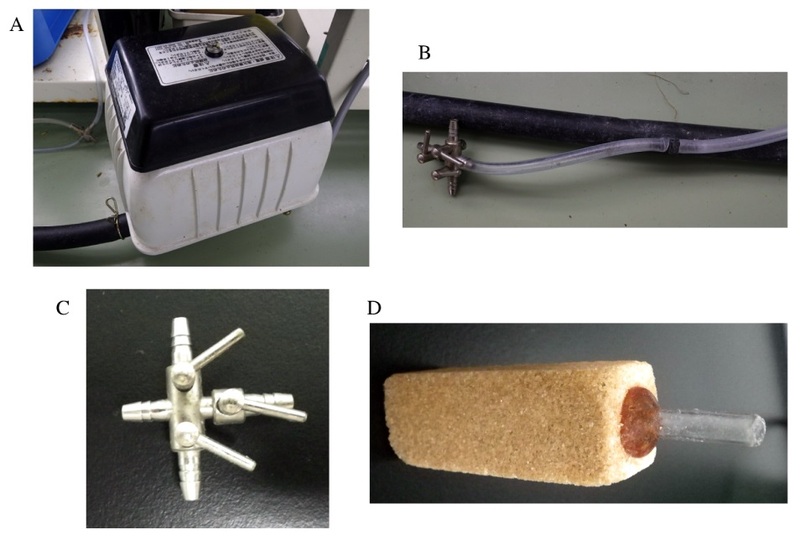 Sow sterilized seeds and grow ‘Micro-Tom’ plants in plant boxes (MS medium containing 2% sucrose) for 3 weeks (Figure 7) (Li, 2011). Extract 3-week-plants from the boxes so as not to hurt their roots (Figure 7). Gently wind sponge around the stems of extracted seedlings (Figure 7). Figure 7. 3-week-plants grown in MS medium are ready to be transferred into hydroponic culture. Sponges are wound stems of seedlings and placed into holes of polystyrene foam board. Transfer seedlings with sponge attached into the holes of polystyrene foam board (Figure 5). Send air bubbles to hydroponic culture using a blower in the same protocol as above (in greenhouse). 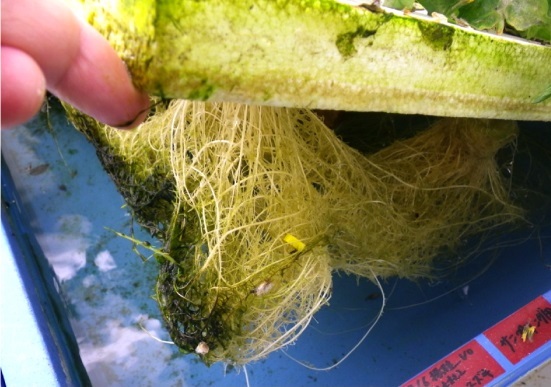 Roots grow within the hydroponic culture after 2 to 3 weeks (Figure 8). Note: Plant density per container is an important consideration, as higher density can lead to increased mildew and other problems. For a container of about 30 x 50 cm size, consider growing 15 plants or less to avoid diseases and other issues (Figures 5-6). This work was supported by the Ministry of Education, Culture, Sports, Science and Technology (Japan) [Grants-in-Aid for Scientific Research (Nos. 20510190 and 23580039 to R M)]. Aoki, K., Yano, K., Suzuki, A., Kawamura, S., Sakurai, N., Suda, K., Kurabayashi, A., Suzuki, T., Tsugane, T., Watanabe, M., Ooga, K., Torii, M., Narita, T., Shin, I. T., Kohara, Y., Yamamoto, N., Takahashi, H., Watanabe, Y., Egusa, M., Kodama, M., Ichinose, Y., Kikuchi, M., Fukushima, S., Okabe, A., Arie, T., Sato, Y., Yazawa, K., Satoh, S., Omura, T., Ezura, H. and Shibata, D. (2010). 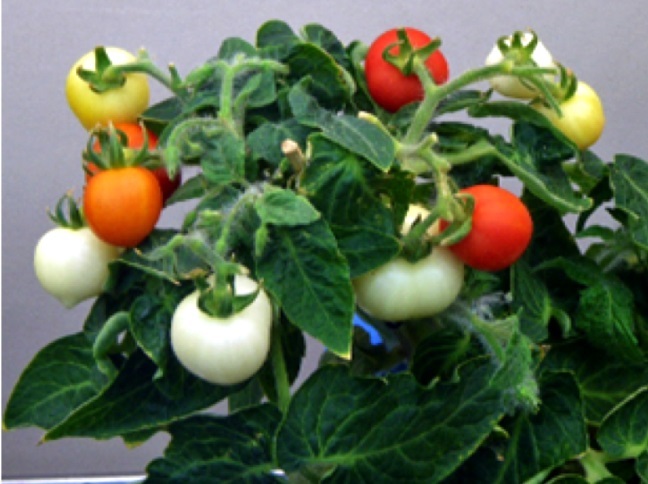 Large-scale analysis of full-length cDNAs from the tomato (Solanum lycopersicum) cultivar Micro-Tom, a reference system for the Solanaceae genomics. BMC Genomics 11: 210. Li, X. (2011). Arabidopsis growing protocol-a general guide. Bio-protocol Bio101: e126. Marti, E., Gisbert, C., Bishop, G. J., Dixon, M. S. and Garcia-Martinez, J. L. (2006). Genetic and physiological characterization of tomato cv. Micro-Tom. J Exp Bot 57(9): 2037-2047. Microelement is Ootsuka hause 5 (Japanese company OAT Agurio) that is powder including Mn 0.77 ppm, B 0.32 ppm, Fe 2.85 ppm, Cu 0.020 ppm, Zn 0.040 ppm, Mo 0.020 ppm.